Londons' Mountain House is a cozy and comfortable mountain cabin tucked into a hillside near Robbinsville, North Carolina. Our guests can enjoy spending some quiet time nestled in the cabin with a welcoming porch and outside swing, explore the many outdoor adventure sites, discover local artisans and their fabulous wares, or relax with a good book ending your day sitting around the fire pit watching the sunset over the Smoky Mountains. As you enter the cabin from the side porch entrance, our cozy living room/dining room welcome you with comfy chairs and country décor. The eat-in kitchen has everything you will need to prepare meals and all you need to bring is your desired foods. There is one bedroom and a full bath on the ground floor with 2 bedrooms and a full bath on the second floor. The attached and covered front porch has seating and a café-sized table and an outside charcoal grill. There is a porch swing located in the yard facing west to view the sunsets. Our fire pit is down the small path off the porch. The shared, gravel driveway has ample parking for multiple vehicles, even motorcycles! We have a supply of kickstand pads available . Spend time hiking the Appalachian Trail, touring Fontana Dam, visiting local street festivals and fairs, enjoy the activities at the nearby Stecoah Valley Center, White Water Rafting the Nantahala, Tubing Deep Creek, visit the Cherokee Indian Village, or enjoy the National Forests. The mountains come alive with local outdoor shows, shopping in Cherokee, 'Unto These Hills' outdoor theatre, or enjoying the local cuisine. For the motorcycle or sports car enthusiast, we are only 15-20 minutes from Deals Gap and Tail of the Dragon and just off the Moonshiner 28! There are many waterfalls and other scenic opportunities for the photographers. Londons' Mountain House is secluded in the southern Smoky Mountains, yet only 12 miles from the Robbinsville grocery stores, restaurants and shopping. The Great Smoky Mountains National Park is just to the north with scenic drives to Fontana Lake and Dam, Cades Cove and the Ocanuluftee Visitor Center just minutes away. A short drive brings you to Cherokee where you can visit Indian museums, go shopping for native crafts, or visit the casinos. A scenic drive beyond Cherokee takes you to Gatlinburg and Pigeon Forge, TN. Or travel to Asheville, NC, (about one & a half hours away) to the beautiful Biltmore House and experience America’s largest home surrounded by inspiring gardens, America's most-visited winery, and the interpretive River Bend Farm. Nearby is the Great Smoky Mountain Railroad for an old time scenic ride or dinner train, the Cheoah, Nantahala or Tuckasegee Rivers for up to Class IV+ whitewater rafting or milder 'rafting with the kids', and three horseback riding stables. For the hiker, the Appalachian Trail is only 5 miles away at Stecoah Gap. From there you can go south to Nantahala Gorge or north to Clingman's Dome, the highest point on the Appalachian Trail in the Great Smoky Mountain National Park. There are other shorter trails close by to explore for those who desire day hikes. For the boaters and fisherman and swimmers, Fontana Lake offers fishing, canoeing, kayaking and picnicking and swimming just two miles away on a lake that has a shoreline that is 80% undeveloped. A marina offers fuel, bait, tackle, boat rentals, equipment rentals, boat launching, and dock space. For those that enjoy driving or cycling on challenging roads, the famous Route 129 - Tail of the Dragon at Deal's Gap is just 18 miles north, The Moonshiner 28 is just minutes away offering an alternative to “The Dragon.” The scenic Cherohala Skyway starts just two miles to the west and you can jump on the southern end of the famous Blue Ridge Parkway in less than an hour. We are veteran owned and offer special rates for LEO's. ENJOY your time at the London’s mountain House! We bought this property because we go to Robbinsville annually for an event called Minis on the Dragon. We decided we'd like to come more often and have our own a place to stay. We have been involved in various types of real estate for the last 30 years. We both retired and are back to work part-time so we don't go stir crazy. I was a school system Director of Auxiliary Services which included everything having to do with the "business end" of running a school district. I also have a background in law enforcement. My wife is an RN. We call the Florida Panhandle home. Once we decided to purchase a home in Graham County, we looked a many properties. 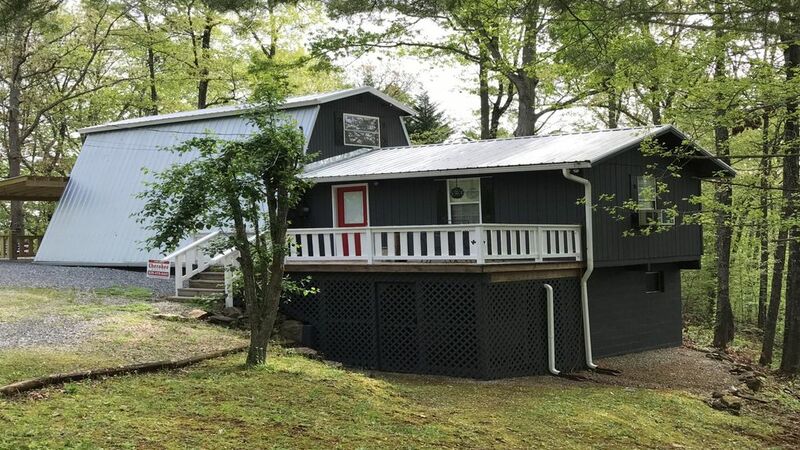 This house kept coming to the top of our list because it was well taken care of, has good "bones" and gave us a homey, welcoming feel when we first saw it. We are in process of changing a few things here and there to make it more in line with our ideas. We really like the solitude and yet the home has the proximity to so much. Fontana Village Resort is only a short distance down the road, The Nantahala and NOC is close by, The Cherohala Skyway is less than 15 minutes away as is the Appalachian Trail. We really enjoy the firepit. Our neighbors are great and there is a real sense of community and sharing. In the several years we have been visitng Graham County, we have come to enjoy the area and the people. Verizon cell phone booster. WIFI calling with cell phones that are capable. Gas heater on first floor and forced hot air units on second floor. Air conditioners are also able to heat. Firm gravel parking area. Motorcycle friendly. Kick stand pads provided. User name and PW included in welcome information letter. Moderate speed not suitable for gaming or streaming movies. Small lawn off the master bedroom and along side of the house. There is a small garden in the corner of the property. This is a fairly heavily treed area. Our property is somewhat hilly. Take Hwy 129 to Robbinsville, NC. At second red light, turn right on Hwy 143 (Ingles Market will be on right hand corner at red light), go 9 miles to dead end, turn left. This is Hwy 28, travel 2.8 miles to Pink Sawyer Road and turn right (Tuskeegee Motel will be on left) . Go about a half mile turn right on Lower Tuskeegee Rd and immediately turn left on Old Yellow Branch Road. Follow Old Yellow Branch Road to Madison Lane and turn left, go approx. 300 yards up hill, turn right at wood rail fence entrance there is a house number on a block by the entrance. You have reached Londons' Mountain House. The house number 158 will also be on corner post of deck to right of stairs.